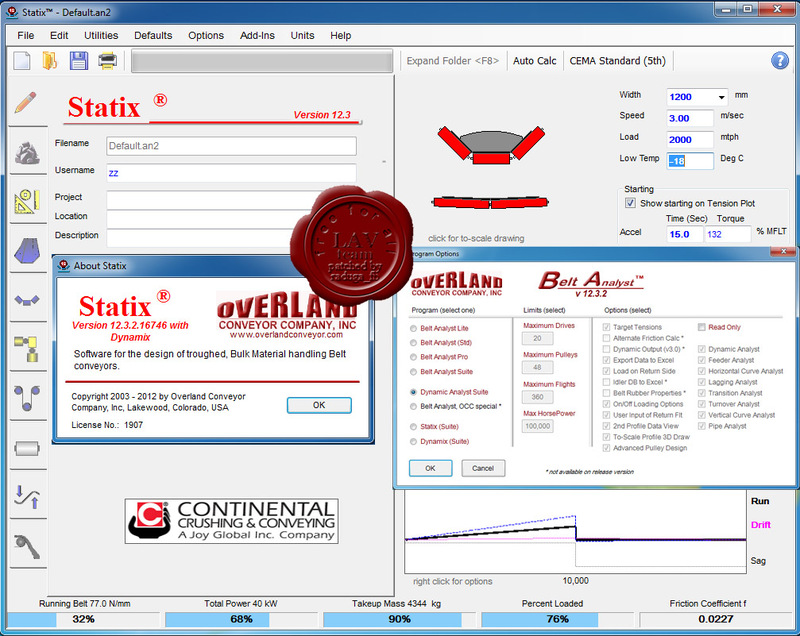 Belt Analyst is designed by conveyor engineers for conveyor engineers. This is not just software, but a real engineering tool. Complete design evaluation of any bulk material handling belt conveyor. You can input any vertical and horizontal profile with up to 360 flights, 48 pulleys and 20 unique drive locations. Use the older and well documented CEMA 5th Edition calculation methods, the newest universal CEMA 6th Edition power methods or the International ISO/DIN methodology. Handy graphics of the cross sectional area, profile and tension diagram as well as many design RED flags makes make this the easiest program to use. Handy databases of belt constructions, idler characteristics and common material properties make the selection process seamless. Use the databases provided or create your own custom data. The automatic calculation routines make component selection easy. Or input the actual component data when each is selected and purchased. 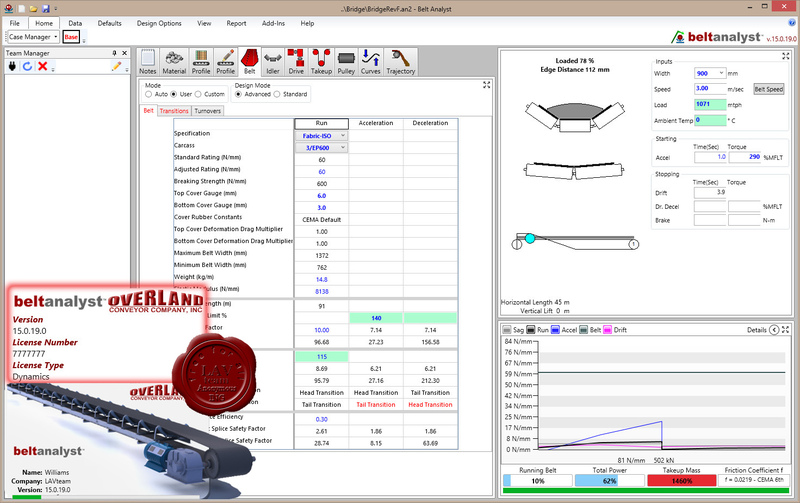 The new pulley setup Wizard helps input all the belt line dimensions and automatically calculates all the pulley wrap angles. A 2 dimensional to scale drawing shows you exactly what you have input and exactly what is used in the calculations. Define pulley blocks for your take-up and drives to help automate the process. 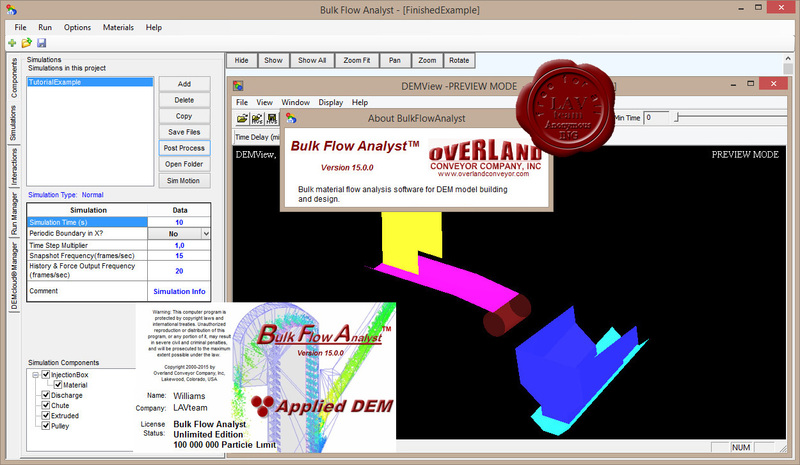 Bulk Flow Analyst is used to simulate conveyor transfer flow: Prevent Chute Plugging, Minimize Belt Wear, Minimize Chute Surface Wear, Mimimize Dust, Minimize Spillage, Minimize Material Degradation.